The Maranta genus includes a few dozen low-growing plants native to the American tropics. Maranta have some of the most beautiful, most decorative leaves in the plant kingdom. The popular M. tricolor has deep green, velvety leaves with yellow splotches down the midrib and arching red veins traveling to the leaf margins. They are fairly common as houseplants, but not necessarily easy to keep growing over the long-term. They require plenty of warmth and humidity, and are susceptible to a number of pests. That said, however, some people have more luck with Maranta species than with the closely related Calathea, which also feature beautiful leaves but can be a bit more tempermental. In terms of display, Maranta are all fairly low-growing plants, with none reaching over about 8 inches tall, making them excellent for grouped displays of low plants on a windowsill. Light: Maranta dislike direct sunlight. If exposed to direct light, their leaves will fade in color intensity and often develop blotches or patches. In the winter, when the plants go into dormancy (and sometimes die back completely), give them bright light to maintain growth. Water: During the growth season, water frequently and never allow potting soil to dry out. They are very susceptible to drought. However, to avoid fungal problems, try not to get water directly on the leaves or let it sit. Soil: A rich, peat-based potting soil with excellent drainage is beneficial. Fertilizer: Feed with a weak liquid fertilizer throughout the growing season. Cut fertilizer back to once a month or so in the winter. Some Maranta species can be propagated by leaf cuttings or rhizome division. The most common (and easiest) way to propagate Maranta is by division at repotting. When repotting, simply divide the plant into half and pot up each half in a fresh pot. Keep new divisions very warm and moist during the first few weeks until new growth emerges. Maranta are not necessarily fast-growing plants and even healthy specimens likely only need to be repotted every other year. During repotting, gently remove plant from its old container, shake roots clean, and place into new container with fresh potting soil. Divide the plant during repotting to increase your stock. Repot in the spring, before the growing season starts. There are many varieties of Maranta, but the most popular by far is the tricolor variation that pops up in garden centers. Alternatively, the Maranta and Calathea plants are so closely associated with one another that it's not uncommon to see labeling errors. 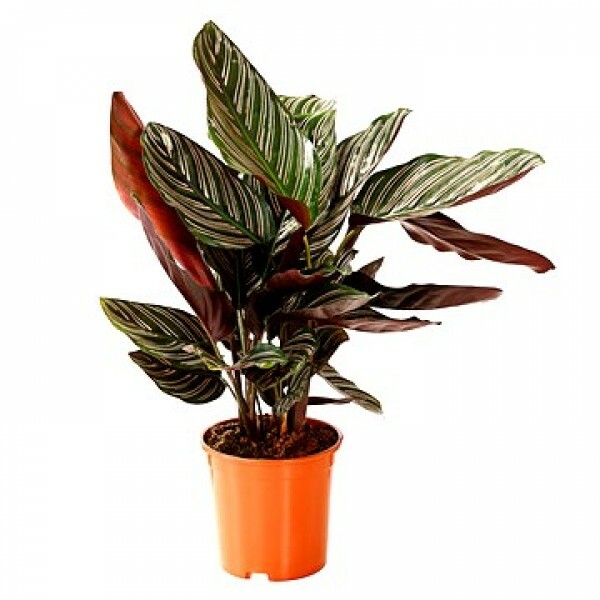 A well-grown Maranta should have full, six-inch-long leaves rising from a short center stem and draping down. They are strikingly beautiful plants. They thrive best with provided with greenhouse-like conditions: warm, moist, gentle airflow, and plenty of fertilizer. Plants that are kept too cool or too dry are likely to lose their leaves or suffer from fungal infections that will cause the plant to die from root rot or collapse. Plants that are exposed to too much sun are likely to become washed out and develop brown blotches on their leaves. These plants, with their fleshy and thick leaves, are prime targets for pests (in my experience) and frequently seem to have problems with mealybugs, aphids, and mites. Signs of infestation include tiny webs on plants, clumps of white "powdery" residue, or visible insects on the plant. Treat infestations as soon as possible to prevent them from spreading to the rest of your collection. As always, start with the least toxic treatment option first, only progressing to more serious chemicals if your initial efforts fail.